Today’s post is timely—many instructors are putting together syllabi for fall courses. This year, Johns Hopkins’ faculty who teach undergraduates are being urged to include course learning goals in their syllabi. Mike Reese, Associate Dean and Director of the Center for Educational Resources (CER), and Richard Shingles, a lecturer in Biology and Pedagogy Specialist in the CER, and created an Innovative Instructor print series article as an aid, shared below. If you are looking for other information on creating effective syllabi, type syllabus in the search box for this blog to see previous articles on the topic. Another resource for writing course learning goals is Arizona State University’s free Online Objectives Builder. It runs instructors through a logical process for creating course goals and objectives. Take the short tutorial and you are on your way. What are course learning goals and why do they matter? Effective teaching starts with thoughtful course planning. The first step in preparing a course is to clearly define your course learning goals. These goals describe the broad, overarching expectations of what students should be able to do by the end of the course, specifically what knowledge students should possess and/or what skills they should be able to demonstrate. Instructors use goals to design course assignments and assessments, and to determine what teaching methods will work best to achieve the desired outcomes. Course learning goals are important for several reasons. They communicate the instructor’s expectations to students on the syllabus. They guide the instructor’s selection of appropriate teaching approaches, resources, and assignments. Learning goals inform colleagues who are teaching related or dependent courses. Similarly, departments can use them to map the curriculum. Departmental reviews of the learning goals ensure prerequisite courses teach the skills necessary for subsequent courses, and that multiple courses are not unnecessarily teaching redundant skills. Once defined, the overarching course learning goals should inform the class-specific topics and teaching methods. Consider an example goal: At the end of the course, students will be able to apply social science data collection and analysis techniques. Several course sessions or units will be needed to teach students the knowledge and skills necessary to meet this goal. One class session might teach students how to design a survey; another could teach them how to conduct a research interview. A syllabus usually includes a learning goals section that begins with a statement such as, “At the end of this course, students will be able to:” that is followed by 4-6 learning goals clearly defining the skills and knowledge students will be able to demonstrate. Faculty should start with a general list of course learning goals and then refine the list to make the goals more specific. Edit the goals by taking into consideration the different abilities, interests, and expectations of your students and the amount of time available for class instruction. How many goals can your students accomplish over the length of the course? Consider including non-content goals such as skills that are important in the field. Content goal: Analyze the key forces that influenced the rise of Japan as an economic superpower. Non-content goal: Conduct a literature search. The following list characterizes clearly-defined learning goals. Consider these suggestions when drafting goals. Specific – Concise, well-defined statements of what students will be able to do. Measurable – The goals suggest how students will be assessed. Use action verbs that can be observed through a test, homework, or project (e.g., define, apply, propose). Non-measurable goal: Students will understand Maxwell’s Equations. Measurable goal: Students will be able to apply the full set of Maxwell’s Equations to different events/situations. Attainable – Students have the pre-requisite knowledge and skills and the course is long enought that students can achieve the goals. Relevant – The skills or knowledge described are appropriate for the course or the program in which the course is embedded. Time-bound – State when students should be able to demonstrate the skill (end of the course, end of semester, etc.). The most difficult aspect of writing learning goals for most instructors is ensuring the goals are measurable and attainable. In an introductory science course, students may be expected to recall or describe basic facts and concepts. In a senior humanities course, students may be expected to conduct deep critical analysis and synthesis of themes and concepts. There are numerous aids online that suggest action verbs to use when writing learning goals that are measurable and achievable. These aids are typically structured by Bloom’s Taxonomy – a framework for categorizing educational goals by their challenge level. Below is an example of action verbs aligned with Bloom’s Taxonomy. Avoid vague verbs like “understand” or “know” because it can be difficult to come to consensus about how the goal can be measured. Think more specifically about what students should be able to demonstrate. Dr. Richard Shingles is a faculty member in the Biology department and also works with the Center for Educational Resources at Johns Hopkins University. He is the Director of the TA Training Institute and The Teaching Institute at JHU. Dr. Shingles also provides pedagogical and technological support to instructional faculty, postdocs and graduate students. Mike Reese is Associate Dean of University Libraries and Director of the Center for Educational Resources. He has a PhD from the Department of Sociology at Johns Hopkins University. That answer indicates a general lack of knowledge about one of the most basic pedagogical principles in education. Here are some straightforward guidelines on what Bloom’s taxonomy is and how you can use it in your class. In 1956, Benjamin Bloom (an American educational psychologist),with collaborators Max Englehart, Edward Furst, Walter Hill, and David Krathwohl, published a framework for categorizing educational goals: Taxonomy of Educational Objectives familiarly known as Bloom’s Taxonomy. The framework consisted of six major categories: Knowledge, Comprehension, Application, Analysis, Synthesis, and Evaluation. The categories after Knowledge were presented as “skills and abilities,” with the understanding that knowledge was the necessary precondition for putting these skills and abilities into practice. In 2001 Bloom’s taxonomy was revised by a group of cognitive psychologists, led by Lorin Anderson (a former student of Bloom). To update the taxonomy to reflect 21st century work the authors used verbs to re-label the six categories and included “action words” to describe the cognitive processes by which learners encounter and work with knowledge. The figures accompanying this article reflect that work. This revised Bloom’s taxonomy proves to be a very useful tool that can be used in all classrooms for several reasons listed below. About ninety percent of the questions students handle in any class are memory questions. The memory level is perfectly respectable and even essential in many learning situations. There are, however, disadvantages in using pure memory that an instructor should keep in mind. The memory level is a tool that promotes the use of short term memory, and the information may be forgotten if it is not used. Another problem with the memory level is that it does not guarantee understanding. We often assume that just because a student can cough up words, facts, and figures that s/he has “learned” and understands the material. That is simply not the case. By moving up the scale to teaching that involves students understanding, applying, and analyzing information, their learning outcomes will improve. That is not likely to happen, though, without some thoughtful preparation. In instructional design, questioning strategies can be as simple as the intentional progression of questions leading to higher levels of thinking and involvement. 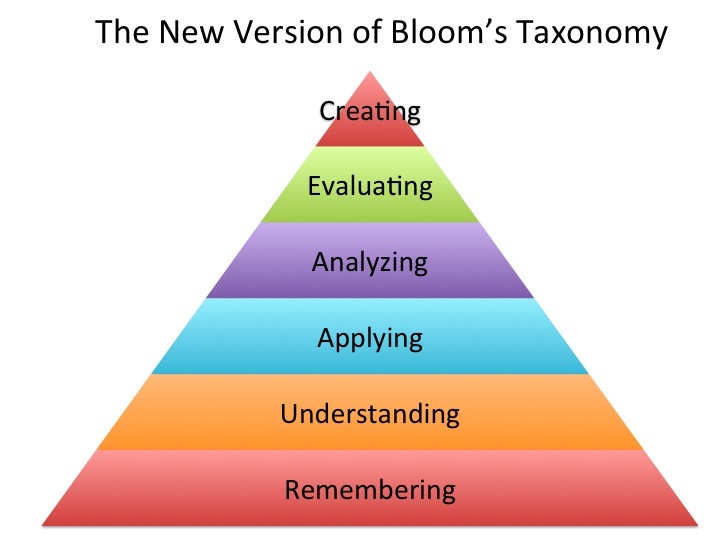 Bloom’s revised taxonomy can provide a framework for constructing those questions. In education, learning objectives are brief statements that describe what students will be expected to learn by the end of a course, unit, or class period. Instructors can benefit from using a framework to construct and organize learning objectives for themselves and for students. Having an organized set of learning objectives helps instructors plan and deliver appropriate instruction, design valid assessment tasks and strategies, and ensure that instruction and assessment are aligned with the objectives. 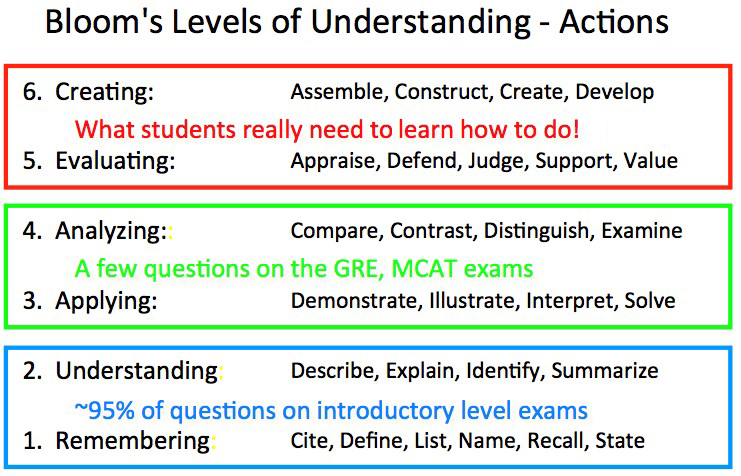 For example, learning objectives following Bloom’s revised taxonomy could be constructed as follows. Exhibit previously learned material by recalling facts, terms and basic concepts. Demonstrate understanding of facts and ideas by organizing, comparing, interpreting and giving descriptions and stating main ideas. Solve problems by applying acquired knowledge, facts, techniques and rules in a different way. Examine and break information into parts by identifying motives or causes; making inferences, and finding evidence to support generalizations. Compile information together in a different way by combining elements in a new pattern or proposing alternative solutions. Present and defend opinions by making judgments about information, validity of ideas or quality of work based on a set of criteria. In-class questioning can be varied from the most simple to those that require more thought. These questions can be categorized following Bloom’s hierarchy of cognitive skills. Here are some examples of questions asked about the story Goldilocks and the Three Bears. Do you remember the story line? The little girl Goldilocks visits the home of the papa, mamma, and baby bear where she sleeps in their beds, eats their food, and sits in their chairs. Remembering: List the items used by Goldilocks while she was in the Bears’ house. Understanding: Explain why Goldilocks liked Baby Bear’s chair the best? Applying: Demonstrate what Goldilocks would use if she came to your house. Analyzing: Compare this story to reality. What events could not really happen? Evaluating: Propose how the story would be different if it was Goldilocks and the Three Fish. Creating: Judge whether Goldilocks was good or bad. Defend your opinion. This is a combination of the above two points. If the course is arranged around learning objectives, designed with Bloom’s taxonomy in mind, then those objectives can be used to construct test and exam questions. This process will ensure alignment between instruction and assessment and provide validity to your evaluation of students’ knowledge and skills. Anderson, L. W., & Krathwohl, D. (Eds.). (2001). A taxonomy for learning, teaching, and assessing: A revision of Bloom’s taxonomy of educational objectives. New York: Longman. Bloom, B., Englehart, M. Furst, E., Hill, W., & Krathwohl, D. (1956). Taxonomy of educational objectives: The classification of educational goals. Handbook I: Cognitive domain. New York, Toronto: Longmans, Green. Recently a faculty member was overhead making the comment that syllabi are just chapter headings arranged by week. The Innovative Instructor hopes that the syllabus for your course meets a higher standard. This post provides guidance and resources towards that end. Richard Shingles, a lecturer in Johns Hopkins Department of Biology who also directs the Center for Educational Resources TA Training Institute, offers graduate students in his workshops a number of suggestions for preparing a syllabus. He suggests first looking at examples to get an idea of what to include. Other faculty in your department might share their syllabi, but there other resources awaiting your perusal. A new online, peer-reviewed journal, called Syllabus is devoted entirely to the display of examples from a wide range of disciplines. At the other end there is always Google. Try searching on “syllabus your discipline” (e.g., syllabus art history) to get started. For the instructor use of the syllabus doesn’t end with distributing it to your students on the first day of class. Keep a copy handy and annotate it as the semester progresses. Perhaps you find you need to spend more time on a particular topic, or that the first assignment might work better if it came a week later. It’s also good to have a copy on hand to remind students that yes, you did state that you have a no make-up policy for quizzes. You should post the syllabus online as well. Posting online could be to your Blackboard (or other LMS) course site. But Dr. Tona Hangen, a professor of history at Worcester State University in Massachusetts, has raised the bar to a higher level by sharing her syllabi via an application called flipsnack. Flipsnack allows you to publish material online in an application that simulates page-turning. You can create a basic account for free. Another similar online application is ISSUU. ISSUU also is free for a basic account. As a side note, ISSUU has been used by at JHU for the Scholar’s Bookshelf project: http://issuu.com/scholarsbookshelf – collaboration between the Sheridan Libraries Rare Books Collection and the Department of German and Romance Languages and Literatures. Dr. Hangen inspires with her beautifully designed syllabi. She has an archive of examples from the past several years. While the ones on flipsnack may seem daunting to the design challenged, some of her PDF versions are more easily emulated. These could be created in Word or a basic design program such as Microsoft’s Publisher, which is often included in the Microsoft Office suite. Barbara Goss Davis reminds us: “…a well prepared course syllabus shows students that you take your teaching seriously. (Tools for Teaching, p. 14). There’s a new clicker on the quad this fall. Clicker is the popular term for the devices used for in-class voting systems. The Homewood campus is now using the i>Clicker Classroom Response System; students can use the same clicker device in multiple courses. One of the benefits of the i>Clicker system is that it is integrated with the Blackboard course management system. Faculty need a computer, either their own laptop or the podium computer in a smart classroom, to use clickers during class. Students simply purchase and register an i>Clicker voting unit. For the Krieger School of Arts & Sciences and the Whiting School of Engineering, the Center for Educational Resources (CER) will provide the i>Clicker software and an RF receiver if needed. Interested faculty can borrow a loaner i>Clicker system to try out in a class up to 50 students. For other JHU schools, contact your divisional instructional support center for information. In-class voting technologies were first piloted in classes on the Homewood campus in spring 2003. Since then in-class voting has become ubiquitous in large enrollment classes at Homewood; over 2500 students per semester use the system. Clickers are used in courses such as biology, chemistry, civil engineering, earth and planetary sciences, history of science and technology, materials science, physics, and psychological and brain sciences. In a typical example, an instructor poses a question, often multiple-choice, to the class. Then students think about the question and submit their responses using their handheld wireless transmitters (clickers). Responses are beamed to a receiver plugged into the instructor’s computer. Software on the computer processes the information quickly and displays a bar chart showing the distribution of student responses. Instructors can then use these responses to decide how to proceed in the class. Opinions vary on whether or not to use clickers for grading class attendance. Some instructors simply use clicker votes to count as participation points, just as they might grade students in discussions. For instructors who would like to monitor attendance over time, clickers can record attendance. Instructors have found that using clickers has dramatically increased attendance in class, enhanced just-in-time teaching capabilities, increased classroom participation and simplified the deployment and grading of quizzes and exams. Data collected over several years in several courses show a direct correlation between clicker participation and final grades. Clickers are generally considered to be one of the foundations of an active learning classroom. contact Brian Cole (bcole@jhu.edu, 410-516-5418) or drop in to the Center for Educational Resources on Q Level in the Milton S.Eisenhower Library. The Carl Wieman Science Education Initiative at the University of British Columbia (CWSEI) http://www.cwsei.ubc.ca/resources/clickers.htm includes an instructor’s guide and videos that show the benefits of, and offer practical tips on, using clickers in the classroom: http://www.cwsei.ubc.ca/resources/SEI_video.html. Derek Bruff (2009) Teaching with Classroom Response Systems, Jossey-Bass.